Valentine’s Day is this week can you believe it!? My daughters class is having a Valentine’s Day party in class this week and we wanted to make Valentine treats that are easy, festive, and of course, tasty! 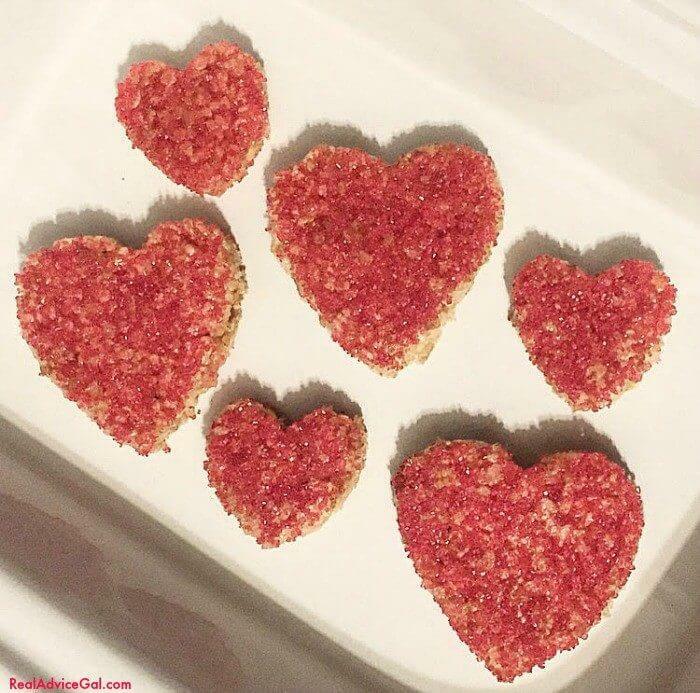 These Rice Krispie Valentine’s Hearts are oh-so-cute and fun to make! You can customize them in so many different ways. 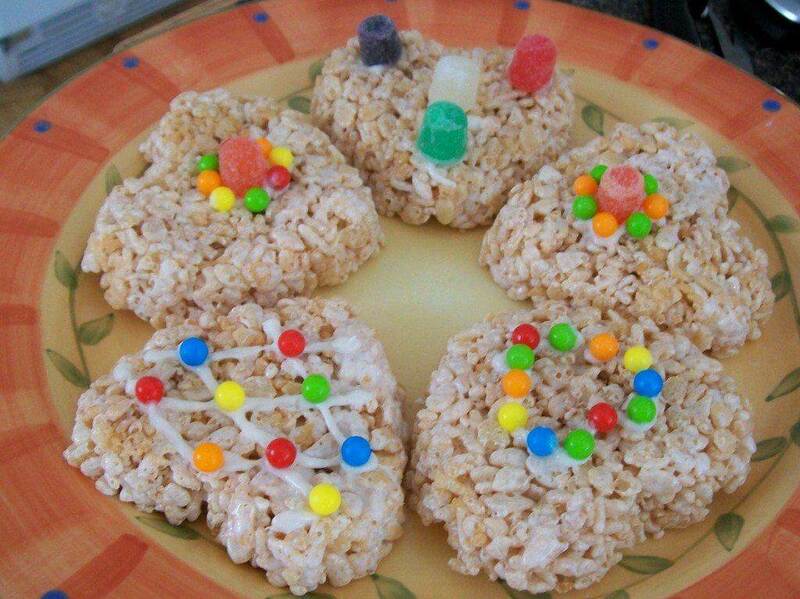 And the great thing about rice krispies recipe is that with a cookie cutter you can customize them for any holiday. What I love most about recipes like these is that you can make them with your kids. Getting your kids in the kitchen with you is great for bonding and can also teach lessons in math (measuring) English (reading), and following directions! So grab your ingredients, your kids, and have some fun in the kitchen! In a large saucepan, melt your butter over medium/high heat. Add in your marshmallows and stir constantly until melted. Remove from heat. Add in your cereal and mix well to make sure the cereal is coated well. Using a buttered spatula press the mixture into a greased 13×0 pan. Let cool. 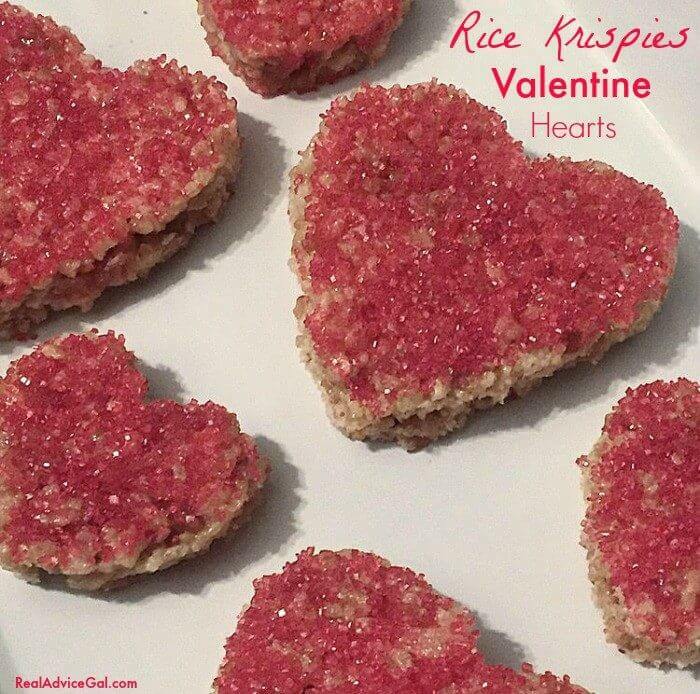 Using a heart shaped cookie cutter, cut out rice krispie hearts and decorate any way you like! You could ice them, dip them in melted chocolate, sprinkle them with candies, sprinkles, dried fruit, etc. The possibilities are endless! Here’s another version of this yummy Valentine treat. 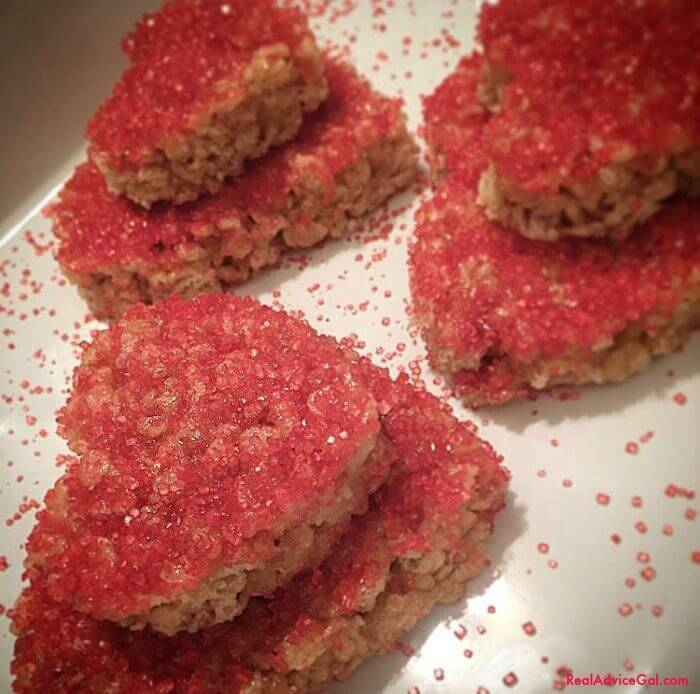 After I made my heart shaped rice krispies I sprinkled red/pink sugar crystals on top. Not only is it yummy it turned out pretty cute too. What treats are you making for Valentine’s Day this year? Need some inspiration? We gotcha! Don’t forget the Valentine’s Day Crafts!